Back of the Cereal Box: But, Truly, Where Are These Wild Things You Speak Of? But, Truly, Where Are These Wild Things You Speak Of? First, I’d like to apologize again for this mishap. I understand that correcting it will come at considerable cost to the studio, but rest assured that the problem is in the process of being remedied as quickly as possible. This note is to explain that I have found out where, exactly, the problem arose. The culprit seems to be one Philomena Arnoldi, a proofer in the marketing department who has been working with Warner Bros. since 1985. Why she holds this position, exactly, I am not sure, as her grasp of English sentence mechanics is shaky at best. 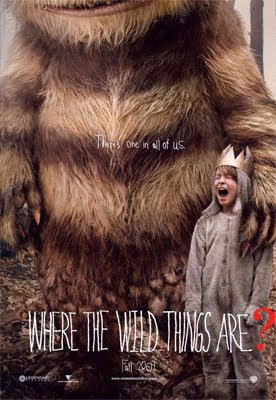 Below see the misprinted Where the Wild Things Are posted above to a similarly misprinted one for Where the Boys Are. In addition to further work that must be done as far as reprinting all relevant promotional material with the correct title, I suggest that the simplest way to deal with Ms. Arnoldi — thereby eliminating the possibility of a similar fate befalling our 2011 release of Where the Red Fern Grows — would be to offer her a comfortable retirement package. Given that she is 94 years old, I am confident that she would accept. The representative offering the deal, however, should be prepared to either explain it in Italian or simply raise his intonation at the end of every sentence. Once again, sincere apologies. Thank you for your patience with this situation. I feel like such a nerd for loving this. But then, that's no surprise. Thanks for the laugh. I just know that someday she will figure out where the question mark goes? Hey, Drew! Thanks for the comment! As you may have noticed from my blog, catching mistakes is what I do. No harm intended, I just want to make the web a better place.